Accent your living room or family room with the Victorian style of this striking end table. The extremely ornate detailing of this piece will bring an enchanting style to your home. The intricate continuous carving pattern around the table top highlights the traditional style while complementing the tastefully designed piece. 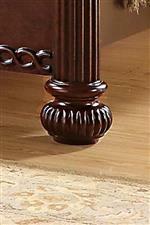 The legs are decorated with detailed leaf formation on top and are molded together by a sleek bottom shelf. The tapered legs are finished on the bottoms with blunt arrow feet. Add a personalized touch by displaying collectibles or any decorative items on the bottom shelf, while putting a lamp on top for convenience and added brightness. This alluring accent piece will look great anywhere in a home, in any home with its impeccable design and style. 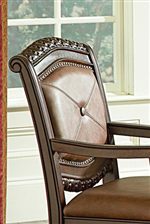 The Antoinette Traditional Rich Brown 1-Shelf End Table by Steve Silver at Walker's Furniture in the Spokane, Kennewick, Tri-Cities, Wenatchee, Coeur D’Alene, Yakima, Walla Walla, Umatilla, Moses Lake area. Product availability may vary. Contact us for the most current availability on this product.